It was the day before the violence started. The violence was later called guarimbas. 43 people were killed and hundreds were injured in the three months of rightwing street blocks. It was 13 February 2014, and I was near my home in Merida, taking photos of young men in balaclavas who were stopping buses at gunpoint. Three of them came up to me. All three put a gun to my head and said they would kill me if I didn’t give them my camera. The next day, two other journalists in Merida were injured by guns in the same place. The violence was after the death of President Hugo Chávez in March 2013. Chávez had been in power since 1999 and changed the country completely. He used money from oil to try to get a ‘Bolivarian Revolution’ (named after Simón Bolívar, who wanted to free Latin America in the 19th-century). He took state control of the oil, electricity and telecommunications and tried to help the poor with healthcare and literacy. There was a rightwing coup attempt in 2002, but Chávez stayed in power until he died from cancer. The rightwing had thought it was impossible to beat Chávez, but when he died, they had a chance. They were surprised when Nicolas Maduro (who had been foreign minister and vice-president) won the presidential election in April 2013. Then, in December regional elections, the Chavista alliance won most municipal areas. The violence, lack of food and inflation after Chávez’s death over the past three years are partly because of rightwing groups fighting against 14 years of socialism. The socialist policies got people - people who are not usually included - involved political and economic decisions. But the problems are also because the price of oil has fallen a lot. Oil is Venezuela’s main export, and many people say the government should have developed other areas and not relied only on oil. Another reason for the problems is that the government did not want to do anything about issues with the exchange rate, imports and prices. Now, the money that people earn from their jobs is sometimes not even enough to buy the food they need. People have to stand in queues for food. The queues start very early in the morning, when it is still dark. The water and the internet are often cut off, and some hospitals are not working as well as they used to. Some people are getting tired of this. The relationship between the people and the national government is getting weaker. The government is talking more than it is taking action. In the last election in December 2015, the right wing won a majority in parliament. And communities are now coming to understand who controls the distribution of food. They are now developing urban agriculture and getting direct relationships with producers outside the cities. The Right is now trying to end the control of President Maduro in the next referendum. They had to get 20 per cent of registered voters to sign at the end of October to get referendum. But many people believe that the Right don’t want to form a government – they, and the rich groups who support them, only want to benefit from the crisis. Main exports Oil (90.6%), gems, organic chemicals, iron and steel. Venezuela has three exchange rates: protected - 10Bs/US$1, official - 650Bs/US$1, and black market - 1000Bs/US$1. The country is affected by oil prices - these fell by 50% in 2015. Families now have more money to spend and now buy twice as much as 15 years ago. People 31.1 million. People per square kilometre: 35.7 (UK 267). Population growth - 1.5%. 89% of the population live in cities. Health Infant mortality - 13 per 1,000 live births (Colombia 14, US 6). Lifetime risk of maternal death 1 in 420 (US 1 in 3,800). HIV - 0.6%. Environment 55% of Venezuela is protected land – the highest percentage in Latin America. But pollution and deforestation are still big problems, and large areas of forest disappeared under water when the Guri Dam (one of the biggest in the world) was built. CO2 emissions: 6.1 tonnes per person. 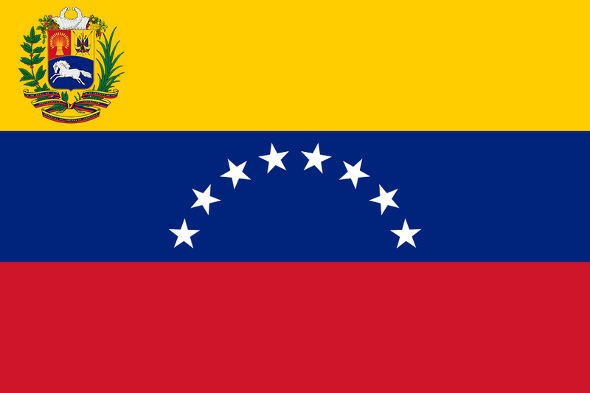 Culture Most Venezuelans are a mix of Spanish, Indigenous and African. 8% say they descended from Africans and 1.5% say they are indigenous. There are also 4 million Colombians. Religion 71% Roman Catholic, 17% Evangelical Protestant. Language Spanish. Indigenous universities and schools also teach in indigenous languages eg. Wayuu, Warao and Pemon. 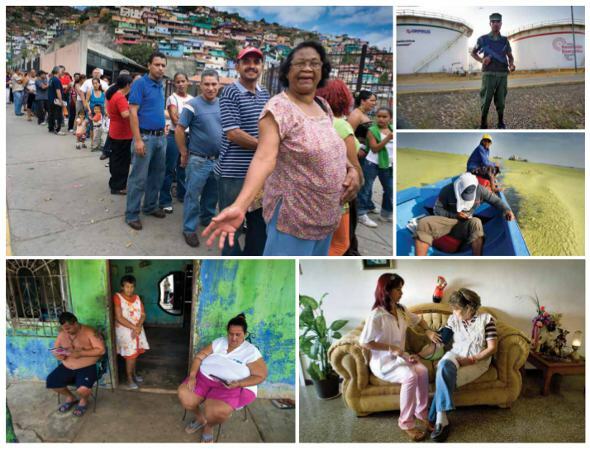 Human development index	0.76, 71st of 188 countries (Colombia 0.720, US 0.915). Income distribution There is a lot less inequality now in Venezuela than 15 years ago. Poverty has gone down from 50% in 1998 to 30% in 2013. But the value of the bolivar has gone down a lot over the past three years, so people who buy foreign currency can now buy a lot more than people who can’t. Literacy 95%, - UNESCO said Venezuela had no illiteracy in 2005. Education, including university is free, often with free food too. Venezuelans know a lot about politics and there is a lot of different culture and arts. Position of women With the Bolivarian Revolution, there are a lot more women in political and public life. But women are still the main carers of children, abortion is still illegal and women are often seen as objects. Freedom There are a lot of different types of media. There are regular marches by people who support the government and people who are against the government. Sexual minorities Public figures now support sexual diversity more and discrimination is now illegal. But many people say negative things because of the conservative and Church culture. NI Assessment (Politics) The national government still thinks it is more important to help the poor and the workers than the business elites – but recently there is more talk than action. The rightwing-dominated parliament, is now attacking ‘Chavismo’ and fighting to set free the people who went to prison for killing people and violence in the rightwing street actions. This parliament has not done anything to help most Venezuelans. NOW READ THE ORIGINAL: https://www.newint.org/columns/country/2016/11/01/country-profile-venezuela/ (This article has been simplified so the words, text structure and quotes may have changed). This page was last edited on 27 November 2016, at 15:56.